In this path, someone comes up with great thinking that ends up being adopted. We’ve seen this happen with “whiz kids” who have the next big thing, and perhaps they’re right. Then they’re put in charge of a team to get that done. So typically this happens when there is a new idea and new strategy to be found, and the person with the strategy idea then gets to execute it. If they do, then they are a strategy + executor. They are both a leader and a manager. This is perhaps the most common path. Someone becomes in charge of a team, or they lead a task force, or they get some temporary help to work on an idea. As they gradually move up diagonally through this grid, they kind of become more of a strategist, and they kind of become more of a manager. Eventually they are doing both with larger responsibilities for setting strategies and making sure they happen. 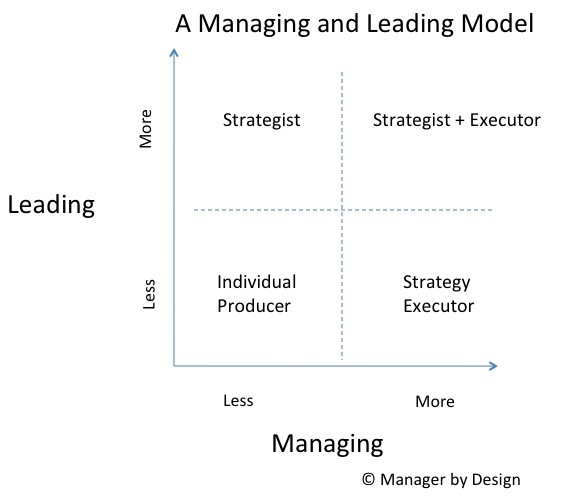 In this view, the newly acquired skills of both setting strategy and executing strategy are all added together, making hard to differentiate between strategy skills and management skills. It all gets conflated with the terms “leadership” and “management” because really they’re doing it all at once, but in a cobbled-together, piecemeal fashion. When looking at this model, you can see the current management designs at work: Some organizations are path 1, others are path 2 and others are path 3. They all can potentially work, and having this view allows both the person on the path and the supporting infrastructure around that path to be designed to optimize that path. For example, if someone is on path 1 – starting with strategy execution, then they should receive structure and feedback on this. If you are aware they are on this path, they should not be expected to set new strategies and sit in a bunch of useless meetings where they have to set strategy. If they are a manager, let’s make sure they are a good manager first. When they are ready to be strategists, we should have a measure that they a) have already mastered the management tasks and b) are interested in and can do the strategic elements. This can be purposefully generated, rather than have random assignments that mystically transform someone from being a manager to a strategist/leader. Again, the structure and feedback can be provided to say, “you are about to do strategy, are you ready and excited?” Then they find out if this is something that they can do and want to do, rather than get backed into doing something they aren’t good at or have no interest in. 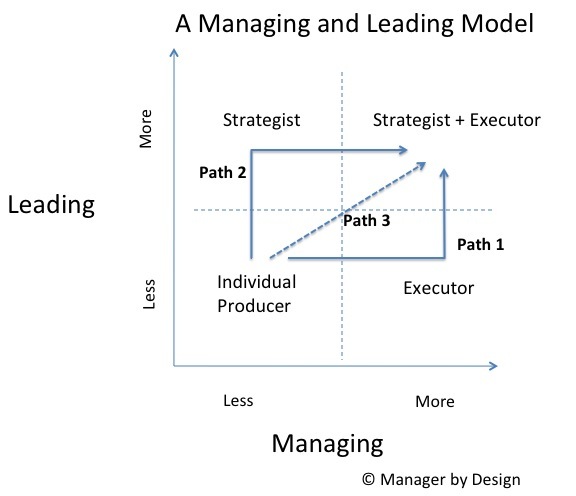 The emerging field of management design should allow for the designs for creating management and leadership that fits the organization’s needs. Often this development is the result of accident and not design, so there is a huge opportunity to help managers, strategists and their employees to get good at these things, rather than watch them flail as so many people suffer through it.